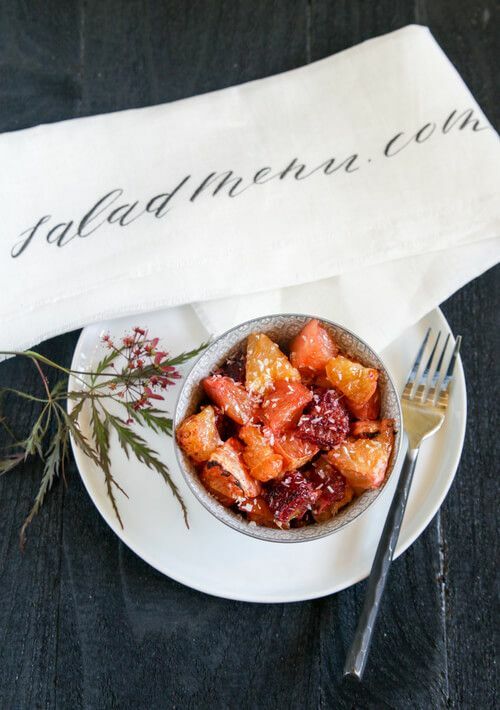 Warm grapefruit salad is a low calorie snack. Grapefruits have many different health benefits. One of the fantastic health benefits of grapefruit is its effectiveness when it comes to losing weight. It is low in sodium but high in enzymes that like to burn fat, which makes it something of a weight loss dream! Grapefruit promotes proper digestion and aids metabolic action. You can read more on the power of grapefruits here. Citrus foods are more than just vitamin C. Their low calorie content is great for people who are concerned with putting on extra weight. To maintain the body's water and acid balance, potassium is an essential mineral. Intake of more citrus fruits like grapefruit and oranges increase the potassium intake and prevent the risk for chronic diseases. Preheat the broiler in your oven. Gently mix fruit with cinnamon and ginger and spread out on a baking sheet. Drizzle honey and sprinkle with coconut flakes.